We hope that you enjoyed your flight and that your stay in London, or wherever your final destination may be, is a pleasant one. Although I’d planned to look at flowers this weekend, that didn’t pan out. I took a walk around the city instead. Sometimes the city has some sad sights. 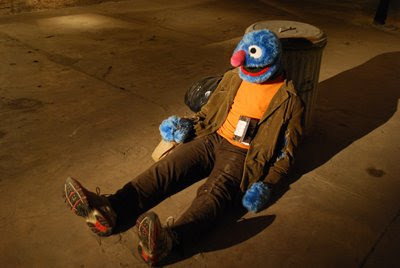 While the eyes of America are focused firmly on how this economic crisis has impacted those on Main Street, let's not forget that times are also tough...for those on Sesame Street. I think I dated him on Match when I lived in NYC. Saving my parents the inconvenience of an international phone call. Eh, we’re all on Verizon nowmy parents don’t even have to use up minutes to talk to me.